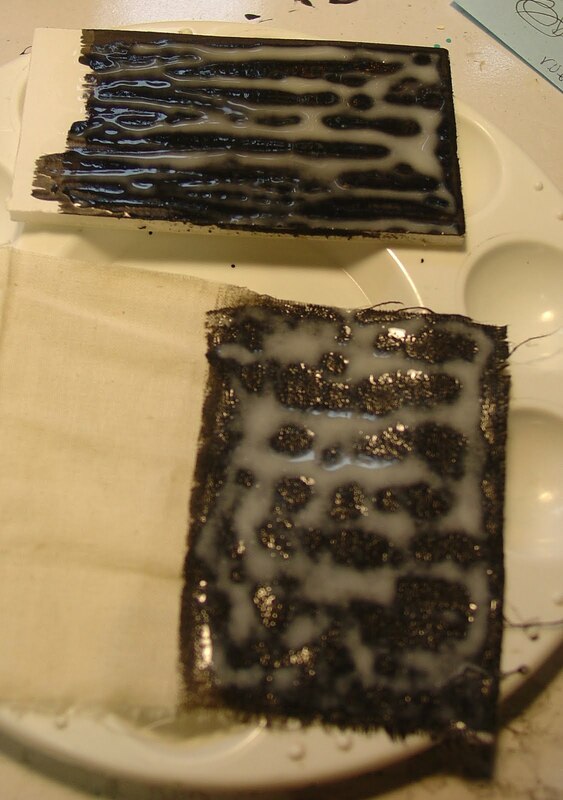 For years whenever I wanted a cool crackled effect on my painted projects I used the very expensive (to me) crackle medium and even bought some paints that were supposed to crack on their own. Because of the cost I did not do anything large and I was sparing in what I did do. Well, thanks to this cheap alternative, I can go a bit crazy and experiment because I found out how to get the crackle effect with Elmer's Glue! It's alot less expensive than any size bottle of crackle medium and just before school it's downright CHEAP. I've been doing this for awhile but if you go to the Elmer's faq site, you can see the instructions towards the bottom of the page. Four sentences of instructions. Four sentences! I had more than four sentences worth of questions when I first did this! On their page Elmer's used wood glue. I used Elmer's school glue or multi purpose glue for ALL of my projects and have always had great results. Even the Dollar Store no name glue works in a pinch. I have never had a "failure to crackle" with these glues. UPDATE MARCH 30, 2012 - One reader has reported using the NEW Stronger Hold formula glue from Elmer's and that the crackle effect was not very good. She then found some Elmer's Glue All that did NOT say new formula on it and had great results. Loads of thanks to MichaLisa for her informative update! So this tutorial, as requested, will have lots of pictures and step by steps so you can see what to expect. 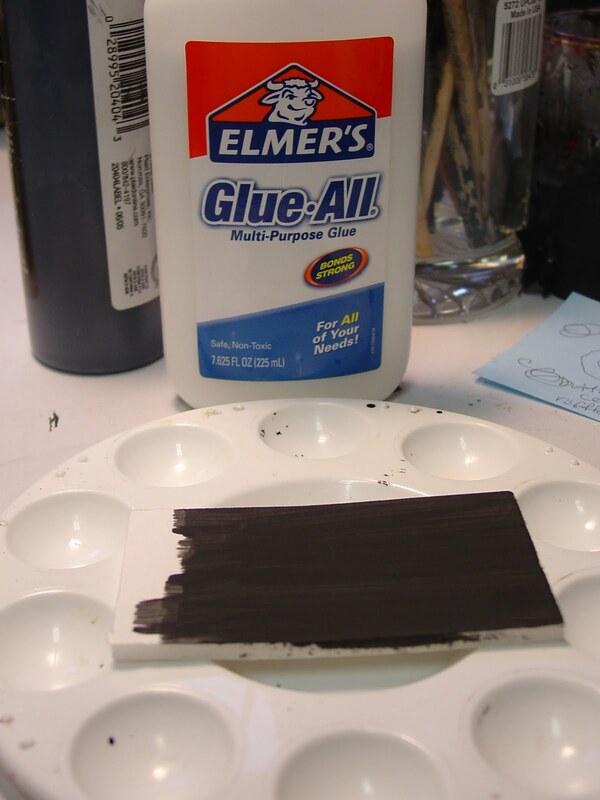 If you have used crackle medium you know the basics, they are the same, but you will use Elmer's glue. I used multi purpose but I see online that others have used the school glue and even generic school glues. For this project I used Elmer's Glue All. 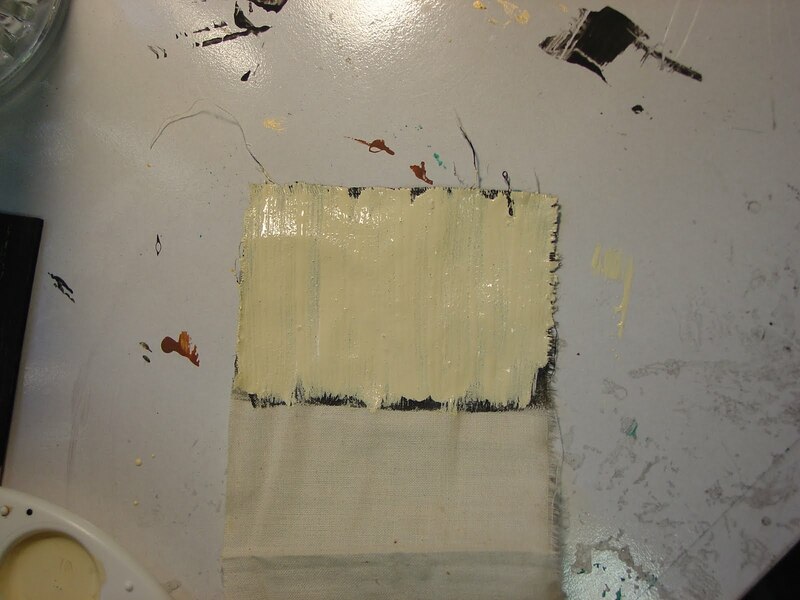 Here is the piece of painted foam board and a piece of painted muslin I have smeared with a generous amount of glue. I used alot so it would show up in the pictures. Let the glue dry til it is tacky, just a few minutes, then paint your contrasting base coat on top. Do NOT wait for the glue to dry all the way or the top coat will not crack. This is one point that you desire tackiness, lol! Let's call it sticky. Alrighty then. For these pics I did NOT thin the top coat of paint. Here are two more pieces of painted muslin. 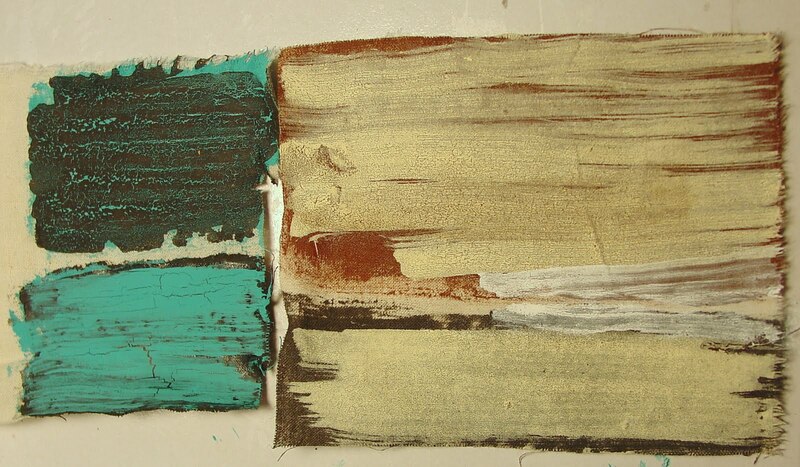 The piece on the left is painted using turquoise and black. The black on the top left piece has been thinned slightly. The turquoise on the bottom left has not been thinned so it's cracks are not as delicate as the black. The big piece of fabric on the right has been undercoated with burnt umber and chocolate brown, then top coated with THINNED glue and THINNED white paint. The cracks are very small and delicate and hard to see in the pic. They are what I prefer for a doll face or something with alot of fine detail. Foam board with black base coat and white top coat. Glue is not thinned and either is the white paint. Board is about 2" x 4". The wood boards in the following pics are about 1.5" tall x 5" wide. I hope I've given you enough options that you can see what to expect with this technique. I would suggest experimenting a little til you find the combination that you like the best before using it on a final project. But have fun, it's easy to do and it's really really CHEAP! Check my sidebar for parties I'll be joining this week. See you there! Thank you so much for this tutorial! I love that you can do this without having to buy expensive crackle medium. Great tutorial! Thanks so much for all the examples. You did a great job. I'm going to experiment myself and see how it goes. Wow! Who would've thought good ol' Elmer's glue could do this?! Thanks for the great directions. I can't wait to try it myself! And thanks also for visiting, and your nice comments. Thanks for this great tip! Does it work if you 'paint' modge podge or a clear coat instead of a top coat of paint? I've been looking for a way to get my clear coat to crackle. Are you using acrylic paint? Ever tried doing this with spray paint? Actually, I've used spray paint for the base coat and it works fine, not as a top coat tho. I haven't tried using modge podge on top to get a clear crackle but try it and see! You might discover something awesome! Tx for the kind words! are you saying you have not tried spray paint as top coat or spray paint does not work for for a crackle effect? Dywayne, I have used spray paint plenty of times for the BOTTOM coat on a project. It will not work as the top coat since the crackle effect is a result of the glue and the ACRYLIC LATEX paint drying at different rates. I do not know if thinning the acrylic latex with water and spraying it on the tacky glue will result in a good crackle effect. Thanks. Love, Love, Love this idea! Thanks so much! And also, thanks for stopping by my blog. You were so sweet. The sheets I used for my porch were just king-sized cotton sheets from walmart. I think I paid $12. I wanted to thank you for such great examples of the crackle technique. Some here i have not tried, like patio paint, or thinned down paint. I wondered if you have ever tried it for outside? I had a student do a headboard once, and just leaving it in the garage the moisture made it all weird. like pealing off. (I like weird, but this was too weird for her). Any ideas, besides don't leave it outside? =) would love to have that look on my garden signs. thanks for coming to my place so i found you. I have tried this before but didn't know not to let my glue dry. You just saved me a gazillion dollars in crackle medium purchases. Excellent step out - thank you for taking the time to share it. P.S. Thanks for stopping by my blog. Very sweet of you. What a great technique, thanks for sharing. This is great! I am featuring it at somedaycrafts.blogspot.com. Grab my "featured" button. What a great way to finish wood. Thank you for sharing such a fun idea. Great technique and a good tutorial. WooHooooooo! What a great thing to know!! I will be using this tutorial soon...amazing the new things you learn! Thanks!!! AWESOME tip!! Thanks to Michelle at Someday Crafts for the tip! I'm gonna share this at Dollar Store Crafts this week, too!! What a GREAT tutorial! I just bought a box this weekend and was planning on trying out crackle paint for the first time....but now....I'm just going to grab some elmer's glue!!! Defently going to try this! Thanks for shareing your talents!! I am definitely going to have to try this!! Thank you for sharing! Thank you so much this is so awesome I will definately be trying this one!!! Very, very, very cool! Thank you!! Great Post! I'd love to experiment with glue, too. Way cool! I too have shied away from big crackle projects due to the price of the medium needed. Off topic question. In you logo there is a lovely blue gazing ball of sorts. Did you make it? If so I would love to know how and what you made it from. Hey this is super great! I've been buying the expensive stuff but no more. :) Thanks for the tutorial! thanks for the great tutorial! i've been wanting to try the crackle technique for years, but was intimidated by the cost and the difficulty. i think i could do this, though. You ROCK!! I just tried this out, I happen to be painting a little today and this is AWESOME!! What a great money saver! OK deep breath.... I linked your tutorial up on my blog redrustyrooster. Come by if you have a sec. Hi Ann, Love your blog and I am now following(stalking) you! Thank you for the tutorial, I really will be giving this a try. Thanks so much for visiting, and for your sweet comments on my "Toot Your Horn Tuesday" vintage floral arrangement. I hope to visit with you often. Me again! I left a little something for you on my blog this morning. Please stop by when you get a chance! This is amazing!! I can't believe Elmer's glue can do this. Thanks for linking it up to my Transform Tuesday. I get so excited every week to see what you and your daughter are going to link up. wow! this is awesome! THAnks so much! Great tutorial--I can't wait to try this! Thanks for visiting my blog!!! 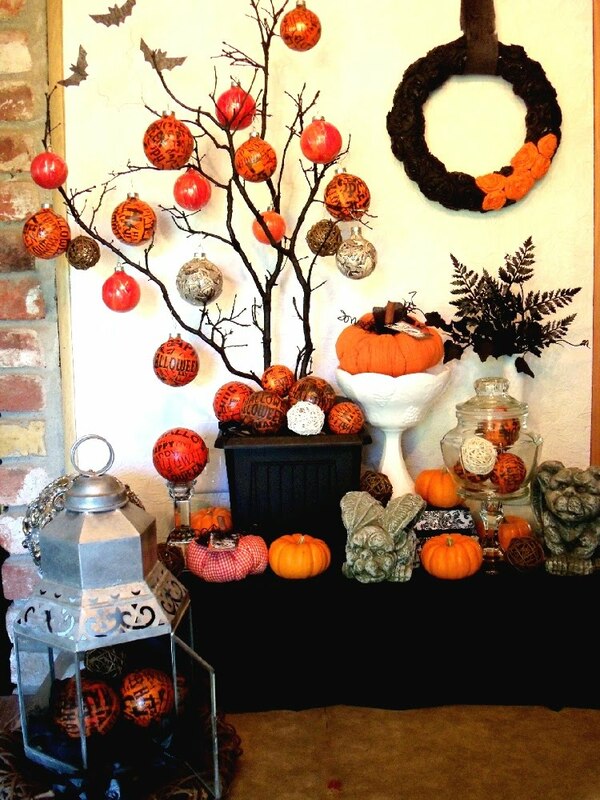 Terrific idea and much less expensive then using all the fancy crackling paints. Thanks for sharing. 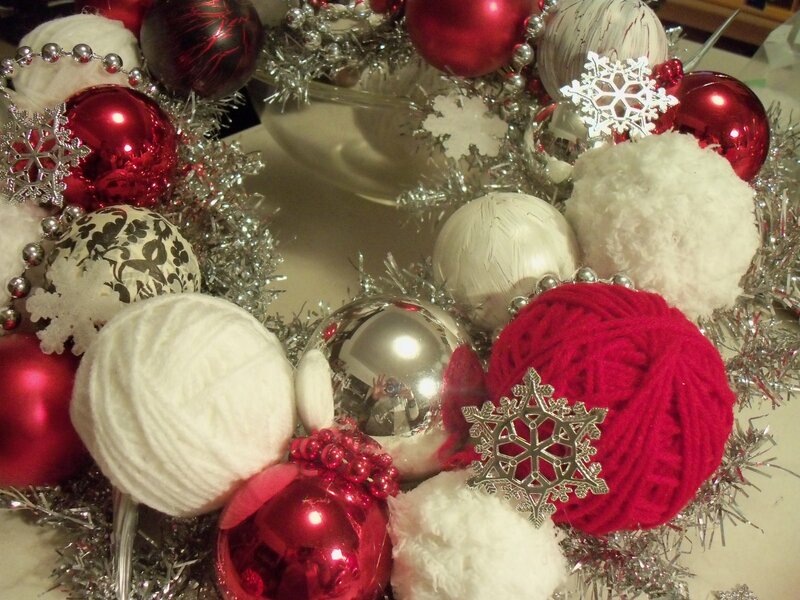 This is very nearly enough to make me want to get all crafty! But you know me better than that, so I'll leave the crafting up to you, dearsis. Your ingenuity never ceases to amaze. Thanks for this great tutorial! Who knew? Your projects look great!! Wow! That is awesome! I love the different looks you achieved! Great tutorial.. thanks so much! Crackle medium is expensive and hard to find in large quantities. I had read on the internet that it can be made from a glue mixture. Thanks for stopping by my crackle project! When I run out of the quart I bought, I am making my own!! Woo Hoo!, that's amazing!! Who would have thought? I've got to give that a try. Thanks so much for linking this post to Woo Hoo! Wednesday and sharing it with all of us. I found you from tip me Tuesday thanks for posting. Love this tip! I must go and crackle now! Great tutorial! I'm going to feature it on my blog! I love this idea! Who knew you could use glue to crackle! I tried to crackle paint my bathroom cabinet. If the directions read as simple as yours it would of been a heck of a lot easier. these directions for crackling sound so much simpler,, got to give it a try. I had no idea. This is a fabulous idea! The possibilities are endless! Great idea. So easy. Thanks! 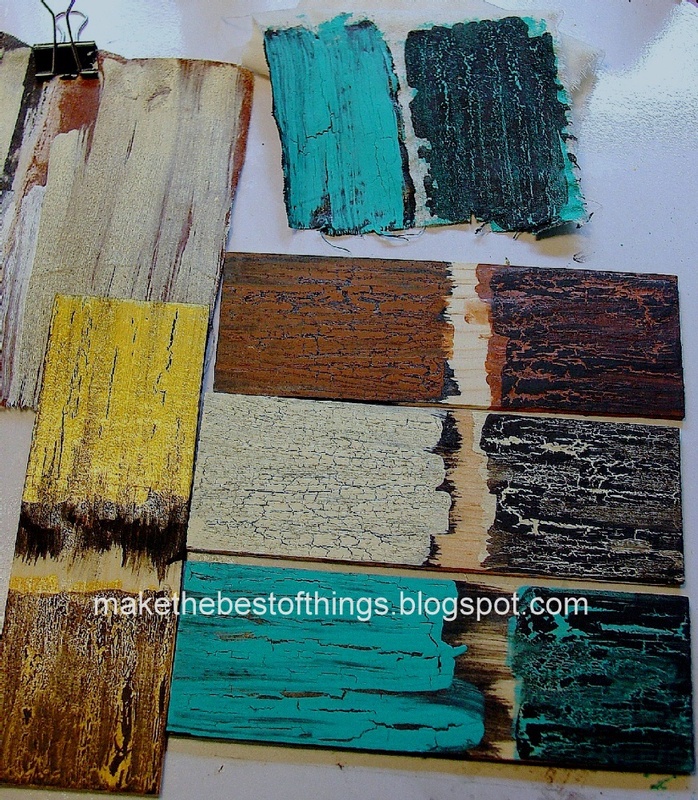 Ive always used crackle paint, but this sounds so much cheaper, and just as easy! Can't wait to try it. Thank you, ladies, for all your positive comments! I've received lots of queries about the blue glass decor balls, I think that will be a blog post very soon! Nice, thanks for all of the show and tell. Great tutorial! I love seeing inexpensive solutions! this is seriously creative! wow! How cool is this! The finishes you've achieved are pretty amazing! Looks totally authentic to me! Thanks for linking this awesome tip up to SNS! Crackalackin'! Wow, this is great to know, thanks heaps! Wow, a project that requires me to be impatient and not wait till it's dry in order to go on?? ALRIGHT! Thanks for sharing this tutorial and such great picture! I never knew this could be done with Elmer's, opens up a whole new world of projects! New follower! That turned out amazing! Stopping by from A Vision To Remember Party. Hello! I'm your new follower. You have a lovely blog here! This is great! 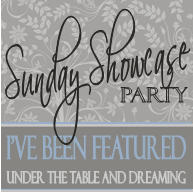 I'm hosting a blog party right now and I'd love it if you linked up! that is a cool technique, thanks for posting such detailed instructions and all the pics. This is freakin' amazing!! I'm so excited to see this! Wow, thanks for sharing this cheapo alternative that looks awesome! Totally gonna try it! Thanks for the visit today! I can't believe you can crackle with glue! Thank you so much! 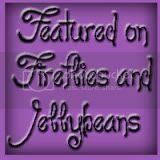 Hello sweet Ann - I'm a new follower of your blog via Met Monday (catching up from last week!). Love the crackle finish that's created with glue! I've never tried it, but I like it and think it would be easy enough for me! Thank you for the tutorial. Great idea and tips. Thanks for sharing at Fun to Craft. Wonderful tutorial...I paint prim signs and I think I'm going to try this technique...my customers will get a kick out of it...to age my signs I rub gulfwax very heavily between my base and top coat..then when I go back to sand to age the sign, it gives the look of chipped paint.....Love your blog...am definitely now a follower..
Wow! That is something I did not know! How cool! Awesome tutorial. I have one little bottle of crackle medium that I've been using sparingly because I'm too cheap to go buy more...lol Now I don't have to. I love this. Great technique -gotta love cheap and easy! I am going to be a Guest Curator on Crescendoh the week of Jun 7th. Would love to link you up if that's ok! oh that's so great! i'm glad you shared this! im for sure going to give this a try! thanks for sharing! love this! can this be done without a base coat? i have a wood box i would like the wood to show in the cracks.. is that possible? Great tip with Elmer's. The Yankee and I have been using various types of glues for faux finishes for years. They're great, and as you said, much cheaper than crackle mediums. Thanks for joining in on the fun at the cottage. This is SO COOL! Thanks for sharing your easy to follow instructions w/ great pics. I want to try this on muslin now! Wow...that is so cool. I NEVER thought of painting muslin before but now I can think of some neat things to do with that! I am so glad I found you! Fun, fun! I might have to use this in both my art and my furniture makeovers! Thanks for the tidbits. Question. I want to do this to the bathroom sink cabinet. Is this waterproof? If it get wet or damp from steamy showers will it affect the elmers's glue? Make it sticky? This finish is not waterproof and will definitely need a sealer if you are using it in a damp/wet environment. I have used a clear acrylic sealer for my outside signs I've crackled and they hold up fine to the weather, but I think for a bathroom you would need some kind of polyurethane varnish to make it waterproof. I would experiment on something small and get it wet and see how it does. I will also check this out on my own and see what works for me, but that's another blog post! I have an entertainment center that I would like to apply this technique to but I would like to add decorative paint (flowers ect.) to make it look like an antique from India. At what step do I do the decorative painting? Do I use some type of clear antique for top coat? Thanks so much for sharing this! I am trying this today (as the crackle medium is expensive!!!). Can't wait to read more of your blog! Ohhh now that's awesome! I just bought another bottle of medium but I want to do a large project and it would have required several bottles of crackling medium. I'm going to try this instead! Thank you for sharing! I'm a professional painting contractor and have been using Elmer's Glue for quite some time as a crackling medium. The commercial stuff just comes by the quart or smaller and costs 15 to 20 bucks per quart. If you have a larger project such as kitchen cabinets or furniture, which are most of my jobs, the large home improvement stores sell Elmer's Glue really cheap by the gallon. I'm sure I pay less than 15.00 a gallon for it. To see some examples of my work, go to http://www.billrosserpainting.com. Very cool! So glad you posted this, I'll definitely use this the next time I crackle! I like you, I admire your spirit and your willingness to share your knowledge! Cool projects! I found you through a 'crackle' search because I just have to paint the mantle and get it done today! lol You know, when the spirit moves you, you move. Best to you in your recovery. I opened a blog just to be able to thank you!! Also, I posted your site to my fb account. Blessing and the Best of Everything!! This is great tutorial! I would like to know if Elmer's glue is a special glue, or can I use another (white) glue, maybe modge podge or equivalent? I've spent part of my afternoon reading your blog and your daughter's blog. What a creative family! I was excited to see this technique. I just received a free paint sample in the mail and thought "It's meant to be!" Not so much :-( I cannot get the paint to crackle no matter WHAT I do. Thin glue, thick glue, thin paint, thick paint . . . no combination works for me. I know that you've laid out the technique very clearly above but do you have any idea on what I may be doing wrong? Thanks so much for sharing this information. I'm back to trying again! Hi, everybody! Thanks for your comments. I try to answer the questions as they come up, but I'm doing a bit of catch up these days. 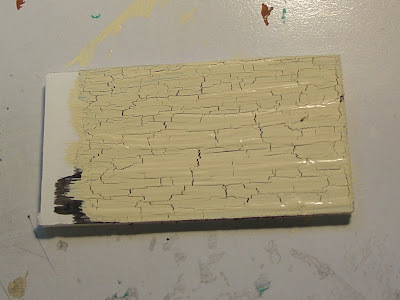 You can do the glue layer over dark wood instead of painting the dark wood, since the crackle effect is between the glue and the top coat of ACRYLIC paint. The dark wood will show through the cracks. I recommend trying it on an inconspicuous spot before doing the whole project to make sure it matches your vision. The top layer MUST BE acrylic paint in order for the crackle effect to work. Mod Podge is a good sealer, but if your project will be exposed to water or moisture of any kind, a polyurethane sealer is a must. Some types of poly give a yellowish tint, so choose wisely. I've been trying to crackle the past few days with weathered wood (expensive) and have not had good luck with it. I can't wait to try the Elmer's. It sounds wonderful. If I want to paint roses, or something similar, how would i crackle those also? Wonderful! You think this would work on canvas? 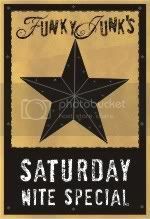 This works well on canvas and gives a great crackle effect. As for crackling the roses on a top coat....hmmmmm. If I were you I would try it on a smaller scale to see if it turns out as you want. Good questions! this is wonderful! thanks for sharing this! Great tutorial! Thanks so much for sharing & can't wait to try! I think there's some elmers buried in the garage. I had to scoop my jaw off the floor because I couldn't believe it could be that easy and inexpensive. I am so excited to give it a try, thank you for sharing! Thank you so much for the tutorial. I love the effect and the colours. I'm now off to follow your blog. you rock. I found you thru pinterest and I am so impressed with this crackle thing you've got going on. I am DEFINITELY trying it today! Hi, thank you for the info. I'm going to try this today! I just have a small question, do you know if it works with spray paint as well? This is by far the coolest thing I've seen! Thanks for sharing... ps... found you on pinterest! Love this - thanks. I tried it and did it wrong so I appreciate this easy to follow post. Great tutorial! I'd heard about this technique, but what I was really looking for was not just instructions but seeing different variations (such thinned or not) and that I found here. Thank you! Any water based GUM will make a nice crackle... the best being Gum Arabic. PVA Remoistenable Envelope glue is what is used by the Crackle glaze medium companies. They buy it in at 40c a kilo and sell it for $45. It's a rip off I know I manufactured low cost Harwoods crackle glaze in UK for a couple of years with great success. Love this! Very descriptive and great various pics. Thank you so much for sharing. Alot of people are trying to make xtra money with crafts and with money saving alternatives this information is invaluable. Thanks so much. just saw this. what a cool idea! love it and I will plan on trying it soon. thanks for sharing. Thank you so much for your tips, and the great pictures! You are an inspiration! God Bless, and hoping you are doing well.I discovered this technique by accident and didnt not only know how to re-create it, but you put the icing on the cake all about it! I linked to your post on my blog - thanks for such an in-depth tutorial - I couldn't say it any better than you did! Love it! Thanks for the ideas and pics...can't wait to try this weekend!! I have a lot of admiration when I see content by other people who are more of an expert in comparison with me on this matter. The audience might think the idea looks effortless, there is however so much going on behind the scenes. Your work is a result of homework and knowledge on your part and you were helpful enough to share all of them with people like me. Hi. My husband tried this tonight and it did not work. The paint did not crackle. He put the elmers glue on and then waited a few minutes and put on the second coat. He waited...and no crackle. Is there a trick to this that we don't know about? It looked like normal paint on foam board. I did not see an email address for you so I hope you come back here! This has ALWAYS worked for me, dozens of times. The base coat on my projects have been spray paint or acrylic paint, even latex house paint, gloss or flat. I do not know how it would work over oil paint or stained wood. 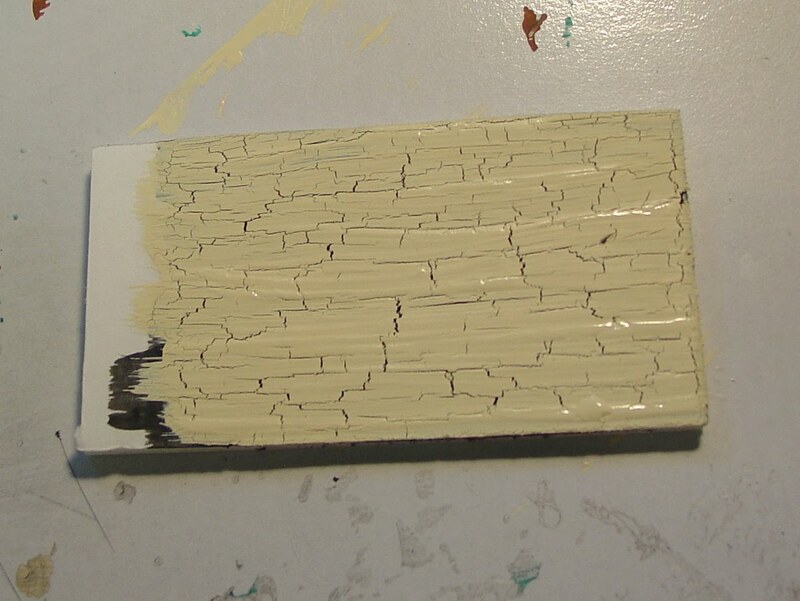 The crackle effect is caused by the glue and the top coat of ACRYLIC paint drying at a different rate. I have only used acrylic paint for the top coat and it always works, even on painted foam board. Elmer's is the best glue for this tho I have used the cheap Dollar Store no name glue, too, and still got the crackle effect. ALSO, the Elmer's website has a FAQ page for this, maybe there is an answer there? You ROCK ! Bye Bye Medium which is pricey ! Hi. You mention that the base coat can be latex, but the top layer can not?? Only acrylic will work? I only see acrylic paint in small containers. Where can you buy it by the gallon? Thanks. About to start a major project and don't want to mess it up! Vicki, thanks for your comment and question. The only latex paint I know of is acrylic latex which cleans up with water. For small projects I use acrylic latex craft paint and for larger I use quarts of regular acrylic latex house paint. The largest project I have done is a 4 foot tall bookcase. The problem with a much larger project is that once the glue dries past the tacky point, the top coat of paint will not crackle. You can divide a large area in sections and crackle each section, but I don't know how the "seams" will look between each area. I would try this "sectioning" technique on a piece of plywood or other large surface and see how each crackled area matches up. Who knows, you might like the way it looks. Good luck!! Thanks for getting back to me so quickly! I want to redo my bedroom furniture, it is a BIG project I know :( Thanks for the idea of sectioning it off. You are so crafty and thoughtful to answer all our questions. Thanks again! Please let me know if you are not happy for me to you use your image and link as an example, and I will remove it immediately. I emailed you earlier, but please be my guest and use the info as you wish. It's a great technique and really fun. Good luck with your art students! Check it out if you want to! So cool! Thanks for the link back. I'll be following you now. Thanks so much! I'm always thrilled when I run into this post online on Pinterest, Google and other blogs. Glad I was able to get the info out there. Anyone ever tried this with latex paint? Misty, the top coat needs to be acrylic latex in order for the crackle effect to work. It is the reaction between the glue and the latex paint (which dry at different rates) that makes it crackle. The bottom color can be spray paint, acrylic latex or even colored glass. I'm going to post an update soon for different surfaces. Check out my post using this technique on my shelves! I LOVE it! Genius! I knew you could use a crackle medium or paint over semi-wet oil-based paint with latex paint, but this is soooo much easier and less messy! Great tutorial! I'm having a blast on my country crafts with this technique. I have discovered that applying paint with a sponge gives great cracks in all directions, while a brush gives me very streaky cracks in one direction. Thanks again! Gotta try that sponging technique, it sounds like fun! Thanks for commenting. Jennifer, sorry for the non crackle! You could be right, one reason for no cracks is letting the glue dry too much. It HAS to be tacky/sticky when you put the top layer of acrylic latex paint on. You must use acrylic latex paint. Also, put the paint on with a light touch so you don't "drag" the wet glue. I suggest experimenting with your glue and paint to see how long to wait before adding that top coat of paint. On one 90 degree day I put the glue on and put the paint on almost immediately then set the project in the sun. It crackled FAST! I bet it was because I was using plain acrylic paint. Thank you so much for the advice! Hi there and thanks for the wonderful tutorial. Definitely the best one I've found! I'm trying to crackle paint an old dresser and am getting very frustrated with the results. The top coat cracks, but in a very unattractive way. Hard to explain, but it's rather wavy and "gloppy". I've experimented with drying times, thickness of application, different brushes and thinning the paint. One thing I noticed is that the glue is Elmer's "Glue All" and it says "Stronger Formula". I wonder if the glue has a different viscosity, elasticity or other characteristic that's causing my less than stellar results? Last night I found a little bit of old wood glue (also Elmer's), which seemed to work better. Just wondering what you think, based on your experience, and if you had a preferred glue that I can look for. Following up on my own question - "Stronger Formula" really is different. Found some Elmer's "Glue All" that didn't say "NEW Stronger Formula" (just "strong bond") and it worked perfectly. I was so excited! Project is now coming along beautifully, after a lot of frustration. The "old" glue was very hard to find, and only in small bottles. Makes me think that they will soon disappear. Next thing to do will be to see if the "NEW" glue will work better when thinned with water. I believe so, because it's not that it didn't crackle with that glue, just not as consistently and nicely. I just didn't have the patience to experiment, by then. The "old" formula is a thinner consistency. Thanks for following up! This is good information. I have only used Elmer's School Glue and recently tried the Dollar Store generic type. Both work well for me. I am so glad you are now getting good results! So the NEW Stronger Formula is not the best for this project. I hope they don't completely do away with the old formula. I will definitely post an update on my post. This is a very major breakthrough in the crackle medium crafters of the world. I can't think you enough for this tip! I'm with 'ya, crackle is not cheap! I would love to give this a try! I featured you on my blog last night. If you would like a Featured Button, you may stop by and pick it up. How does this work on a big project? I plan on doing a kitchen table, picnic table to be exact. Big table. Do you spread the glue? Or do you just squirt it in lines? Your project sounds like fun. After you squirt the glue on the table, spread it with a brush. It needs to be a good, thick layer, so don't spread it too thin. Also, the glue needs to tacky wet, not dry, before you add the top paint layer. 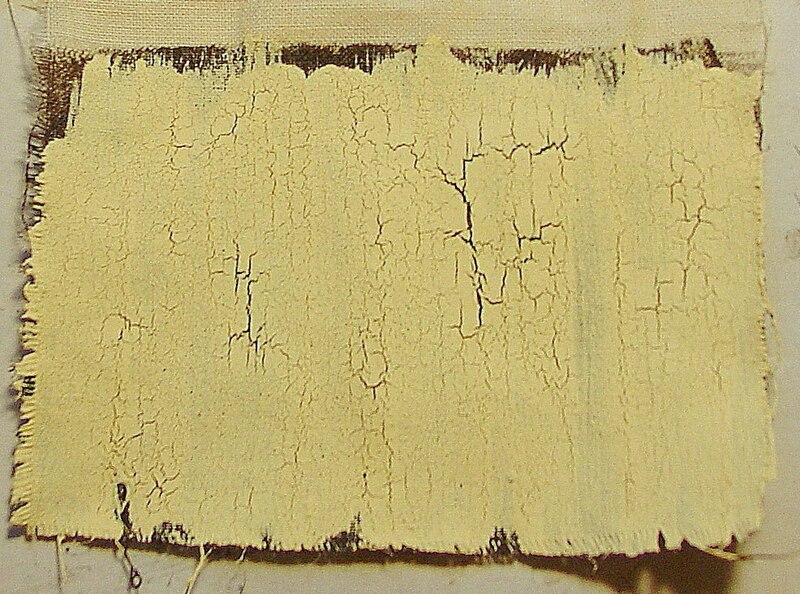 The crackle effect happens when the glue and paint dry at different rates. Since you are doing a picnic table, I would do each board instead of trying to do the whole table at once, so you can stay "on top" of how fast the glue is drying. Also, if you are going to use this table outside, you will need several coats of sealer. The best, most durable sealer is spar varnish, which is used on boats. The finish is nearly indestructible. Good luck and have fun! I've never used a crackle medium before, and I almost bought some at Michaels just yesterday. I am SO glad that I didn't spend a bunch of money! Thank you for the excellent tutorial, with clear and easy to understand pictures. I linked to this post on Nest Candy for Money Saving Mondays. Thanks! This is so amazing! Can't wait to get my hands on it to try it myself! Can't wait to try this!! Thanks!! Can you use Gorilla wood glue, and the paint that i was going to use just says Latex. Would that be the same as acrylic latex? Latex paint is acrylic paint and vice versa. Check online or with your paint supplier if you are not sure. I have never used Gorilla wood glue and I don't know if its formula will crackle the paint. Your best bet is to try it out on a small piece of the same material you want to paint. You will know very quickly if this combination of glue and paint works for you. The good news is that Elmer's is cheap and easy to find and any acrylic craft paint crackles very well. Please post if the Gorilla wood glue produces a good crackle for you. That would be good info! has anyone used wood stain for either the base or top coat ? Cody, I hope you return to read this. I have not used wood stain, nor has anyone else mentioned using wood stain either way. The crackle effect is a reaction between the glue and the top layer of latex paint so the bottom layer can shine thru the cracks. Maybe use an acrylic stain? Best bet, experiment on some samples and then you will know. Sounds intriguing, I may have to try it myself. Thanks! I had been letting the glue dry and was wondering why it wasn't working.Thanks for the tute! Rory, I have only used Elmer's type glue and similar formula glues like the Walmart house brand and even Dollar Store school glue. Best bet, try it out with the glues you have available. One furniture restorer mentioned that the Elmer's type glues started out as "hoof" glues made from animal parts. I would make a few sample boards and try it out. You'll know quite quickly what works for you! Good luck, have fun! Wow..you are sensational..thank you for sharing such a wonderful technique..I like you use(d) crackling sparingly due to expense..I am in hog heaven..just bought some dollar birdhouses today at Michaels. I am going to use this technique on them..thanks again..you are the best! I was wondering if this would work with spray paint? I went out and bought the crackle spray paint and I was highly disappointed. It did not turn out as "crackly" as I wanted. Then I came across this post!! yay!! Would I be able to do this with spray paint? Would it work the same? I don't think it would work with regular spray paint because of the "drying dynamic" between the glue and the acrylic latex paint. I know that some gals have thinned their craft paint with water to use in a spray bottle but I could not predict if it would work with this technique. Best bet is, set up some sample boards and try it. You might figure out something really cool! And I DO use regular spray point for the bottom color on my projects but for the top I use glue and acrylic paint for the crackle effect. I am THRILLED with my results! I did a corner curio cabinet that was stained brown but never varnished. I painted flat blue base then glue, then while barely dry I applied the top coat, a gloss finish latex. The glue was the new stronger hold elmers and it worked beautifully for me. I applied all the coats with the same old house painting brush, barely let the glue set before I top coated and it 'floated areas of the white and it is exactly what I had pictured in my mind's eye! I'm so happy! I would love to post photos if I could. Is that possible? I don't know if you could post a pic here in the comments section but if you email me a photo or even a link, I will certainly add it to the body of this post. It would give readers a great boost to see how your project came out. My email is makethebestofthings@gmail.com. I would LOVE to see your finished cabinet! Do you think this would work on a canvas painting? Yes, it does work. I've used it myself. Depending on the effect with the colors you are looking for it can look great. You can use it in one area or the whole painting. I suggest you try it on a sample canvas before committing a big project, so you can see how the process works and if it is what you want. Good luck! Thea, that came out great! I love the colors you used. What a clever re use of the coat rack. Thanks for posting your link! I just painted my door blue with a latex-based paint. I'm trying to get it to look like the TARDIS from Doctor Who and it's not quite distressed enough for my liking, even after a ton of sanding. Do you think this method would work for me if I did it in a few spots and painted a darker blue over the glue? I think this idea is brilliant by the way. Trixy, anywhere you put the darker blue then the crackle will give you a localized crackle effect with the bottom blue showing through. I've done it this way on paintings that I did not want to crackle all over but only in spots. Just a note if this is an exterior door, you may need a clear sealer over the crackled areas to protect it. I hope your TARDIS project comes out awesome!!! Ann...thank you so much for sharing this..I finally tried it on a cigar box..I posted on my blog and made sure to mention you and have a link to you..thanks love how it came out. Thanks for the tip. I didn't use this for crackle, but the glue improved the distressed look I was going for on a canvas. Is iy easy to dust or does it flake off? Is there a good top coat to use to make it more 'dustable'?? Thanks so much for the tip! The crackle finish when dry is very dustable and durable. It is not a real rough finish and is surprisingly smooth. You can spray your project with clear acrylic to seal it, which is what I do. To clean a crackled surface I just use a damp cloth. I have also used it for wood birdhouses and garden signs outside and have to seal them every year with multiple coats of spray acrylic to keep the crackle coat from peeling off. So far, they still look good! I will have to put together a blog post about that. Awesome! I need to try this soon! I was wondering what brand of gold patio paint you used?